I needed to delay the execution of some code the other day. This was a test that was trying to simulate a few things happening, and one batch needed a random delay. I started typing and got something I didn’t expect. Where’s the TIME or DELAY? 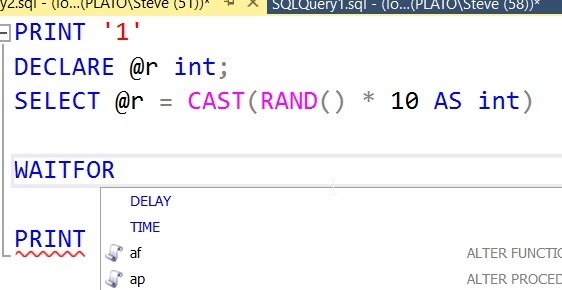 SQL Prompt didn’t like this, and since I expect SQL Prompt to save me from writing bad code, I knew I’d done something wrong. I backed up and removed the parenthesis and ‘R’ and then typed again, this time adding a space. That works. 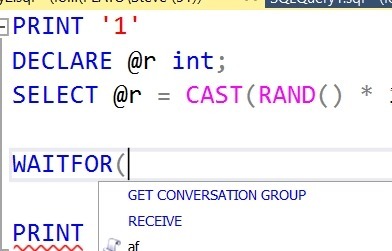 Now I can change this test to real code. WAITFOR is designed to delay execution, but it’s not a function. No parenthesis. Instead, it’s a control of flow statement, like CASE, so it just takes other expressions after. This was one of those commands I haven’t used in a long time, but is a handy one. Hopefully this 5 minute writeup will help me remember this in the future.